Seven children of a Philadelphia couple under investigation in the death of their 8-month old son have received court-ordered medical examinations and any needed immunizations. Herbert and Catherine Schaible’s seven children were placed in temporary foster care after the couple told police they did not bring their 8-month-old, Brandon, to a doctor when he showed serious signs of illness last month. The Schaibles are members of the First Century Gospel Church in northeast Philadelphia. The 500-member church teaches that “it is a definite sin to trust in medical help and pills,” and says that a person’s salvation depends on trusting God to heal without medical help or medicine. These faith-healing-only teachings are a form of spiritual abuse that make the church theologically a cult of Christianity. 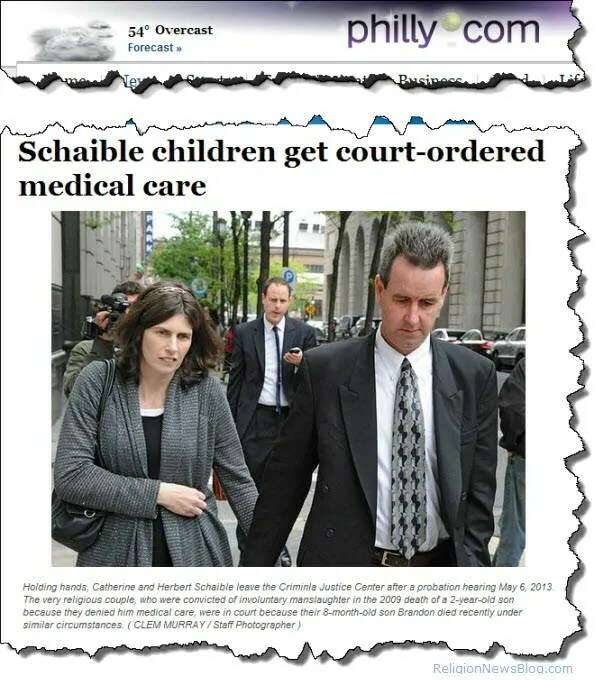 In December, 2010, the Schaibles were convicted of involuntary manslaughter and child endangerment in the 2009 death of their 2-year-old son whom they had tried to cure with faith healing. At their sentencing the couple promised a judge that they would never again choose religion over medicine, before they were sentenced to 10 years probation. The couple has not been charged pending the results of Brandon Schaible’s autopsy. If it determined that their child died as the result of their reliance on faith healing instead of providing medical care, the Schaibles face five to ten years in prison for the probation violation, along with other possible criminal charges. They may also lose custody of their remaining children. Attorneys for the Schaibles say the parents do not object to authorities providing their surviving children with immunizations and other medical care. Satan tests through illness. God is a jealous God. Trust in medicine and doctors is idolatry. Only true faith in the divine power of God heals. The fact the the city has placed the Schaible’s children in temporary foster care — in the home of non-believers — worries Clark. To prevent that from happening again, Clark said, he is trying to reconcile the demands of the state with their own beliefs. He said church teachings would allow a child welfare agency to arrange medical visits. This way, he explained, someone else could initiate the calls to a doctor.